🍞 D.C. readers: You're invited! Join me tomorrow at 8 a.m. to explore how medical marijuana is shaping the future of health and wellness. With a "healthy toast bar." RSVP. 🇮🇱 Israel is voting today to determine whether longtime Prime Minister Benjamin Netanyahu stays in power. Exit polls will be revealed as soon as polls close at 3 p.m. ET. President Trump has directed top officials to execute the most aggressive changes in immigration policy since his inauguration, sources tell Jonathan Swan and me. Some officials consider the moves legally and politically dubious. The new policies, which the administration wants to impose using executive authority following the ouster of Homeland Security Secretary Kirstjen Nielsen, would be even more restrictive than those of his first two years. Asked whether to expect an acceleration in deportations, a senior administration official, familiar with internal deliberations, said: "Yes, that’s the critical part of restoring integrity to the system." 1. Make regulatory changes to make it "more difficult for low-skilled immigrants ... to gain admission" into the United States, "and easier for high-skilled immigrants who are likely to be self-sufficient." The Trump administration has produced a draft regulation for this, but it hasn't been finalized. 2. Make it more difficult for people to invoke their fear of returning to their home country in order to seek asylum in the U.S. The official said the new DHS would "apply greater rigor and scrutiny to these [asylum] claims rather than credulously accepting what's said." The official said the State Department could "produce an analysis" comparing an asylum-seeker's claims "against the actual conditions in their home country." 3. 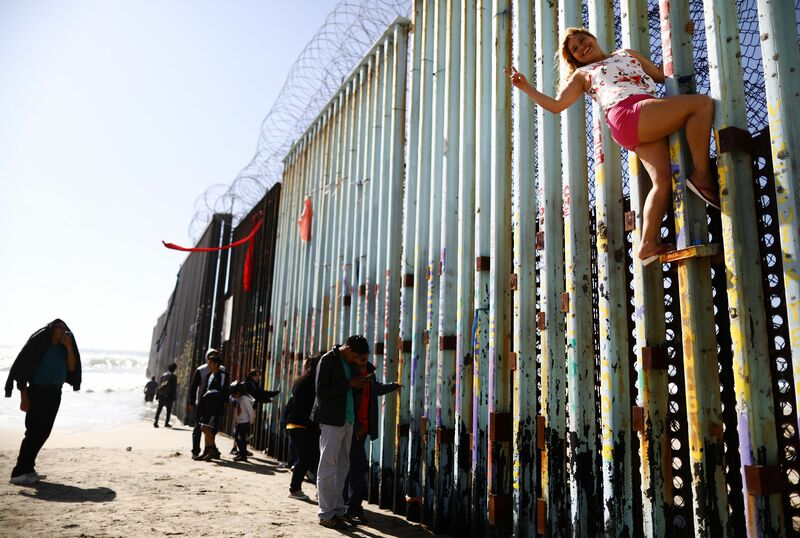 The official said the White House is frustrated by the granting of work permits to asylum seekers so soon after entering the country, describing the practice as "a major draw." The official described previous U.S. practice as "charity toward all, malice toward none." 4. The White House also wants to change rules to allow the government to detain migrant children for longer than the 20-day limit allowed under the so-called Flores agreement. The Trump administration has produced a draft regulation for this, but it hasn’t been finalized. The planned policy changes will face enormous challenges, legally and politically. Reality check from Axios' Stef Kight: Two of the biggest attempts by the Trump administration to implement policies to curb asylum — a proclamation to prevent anyone who crossed the border illegally from receiving asylum, and the “remain in Mexico” policy— were ultimately blocked in court. Trump's decision to oust Nielsen was born out of the president’s deep frustration with her reluctance to implement major policy changes, according to senior administration officials with knowledge of the president’s thinking. This included what Trump viewed as her failure to stop a large number of people from seeking asylum in the U.S., or to dramatically cut back on the number of poor and low-skilled migrants coming to the U.S.
Trump was also frustrated at what he perceived to be the slow speed of deportation of people in the U.S. illegally. A second senior official added that part of Homeland Security's problem was that it was “woefully understaffed” under Nielsen. The other side: Sources close to Nielsen tell us that Trump and senior policy adviser Stephen Miller have called for changes that are legally dubious and would therefore be operationally ineffective. Nielsen has found Trump's demands unreasonable, and he has privately described her as "weak on the border," even though she oversaw actions that many viewed as the most brutal in recent memory — such as the "zero tolerance" policy that separated migrant parents from their children. These sources say that Trump’s desire to make it dramatically harder for people to seek asylum in the U.S. wouldn’t produce lasting changes because they would immediately lead to court challenges. "The so-called immigration hard-liners have flailed about since the beginning of the administration, giving bad advice to the president and misdirecting resources." Senators Mark Warner (D-Va.) and Deb Fischer (R-Neb.) will debut a measure today that cracks down on manipulative design features in major web platforms — Google, Facebook, Amazon — that are meant to capture users’ consent or data, Axios' David McCabe scoops. Why it matters: Lawmakers are trying to put checks on the fundamental design choices that Silicon Valley uses to attract and retain users. "Dark patterns," targeted by the new legislation, can get users to agree to data collection practices they wouldn't consent to if they understood. An example of a dark pattern is when LinkedIn prodded users to let it email their contacts with either an invitation to join the users’ network or create an account on the service. The Deceptive Experiences To Online Users Reduction Act would apply to online services with over 100 million monthly active users. The bill would make it illegal for a service to "design, modify, or manipulate a user interface with the purpose or substantial effect of obscuring, subverting, or impairing user autonomy, decision-making, or choice to obtain consent or user data," according to the draft text. It also bans design features aimed at "cultivating compulsive usage" for kids under the age of 13. The White House said Secret Service director Randolph "Tex" Alles will soon leave his post — an announcement that shocked agents but didn't come as a surprise inside the West Wing, Axios' Alayna Treene and Jonathan Swan report. Alles, who had no Secret Service experience when appointed by President Trump in April 2017, was selected at the personal urging of then-Secretary of Homeland Security John Kelly, a senior administration official told Axios. "Nobody wanted him in the first place," the official said. "He was a John Kelly buddy that everybody tried to stop the president from hiring." The big picture: "Trump moved to clear out the senior ranks of the Department of Homeland Security ... as he accelerated a purge of the nation’s immigration and security leadership," per the N.Y. Times. Senator Chuck Grassley (R-Iowa): "Without names, there’s people in the White House that speak about immigration ... They haven’t accomplished a whole lot, so they need to find some other way to make themselves look important." Between the lines: A White House official said reports tying Alles' removal to Kirstjen Nielsen's departure or the security breach at Mar-a-Lago are "inaccurate." Acting chief of staff Mick Mulvaney "was asked by the president to notify Alles we'd be making a change," the official said. "[Alles has] known for about two weeks now." Evan Osnos tells me: "Twitter has been a force for good on this one; we've received tons of serious advice. 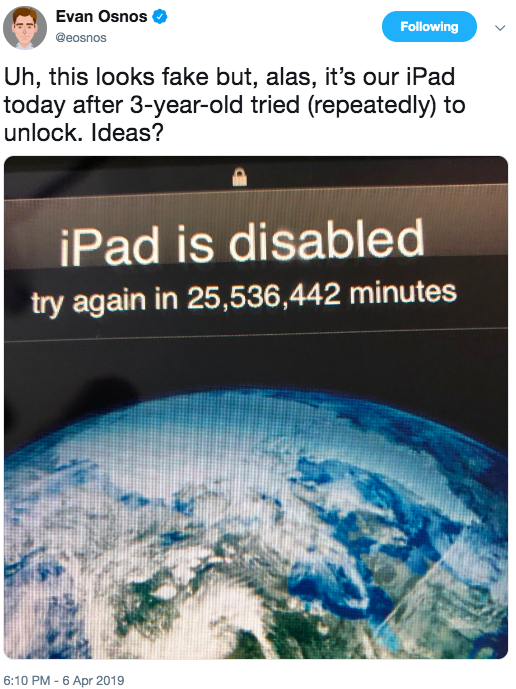 So far, nothing has unlocked it. The operating system might be too old. Next step: Genius Bar." The world’s biggest tech companies are spending billions of dollars on projects to get more people around the world connected to the internet, Axios' Sara Fischer writes. Why it matters: Tech companies historically have specialized in services like social media or payments that ride on top of internet connections, rather than building the networks themselves. But their businesses can't grow without quick expansion of the web, and owning the broadband pipes is becoming just as important as owning the content that runs through them. What's new: Facebook is in talks to develop an underwater data cable ring around Africa, The Wall Street Journal reports. The project aims to drive down internet costs so that Facebook can get more people using its services. Google owns the majority of the 63,605 miles of submarine cables around the world. Amazon said it will launch thousands of satellites into space to provide internet around the world, via a new effort called Project Kuiper. SpaceX is also hoping to use satellites to beam broadband. Go deeper: Today's internet is by land, sea, air and space. "Today’s Democratic Party is increasingly perceived as dominated by its 'woke' left wing. But the views of Democrats on social media often bear little resemblance to those of the wider Democratic electorate," write Nate Cohn and Kevin Quealy of the N.Y. Times. "The outspoken group of Democratic-leaning voters on social media is outnumbered, roughly 2 to 1, by the more moderate, more diverse and less educated group of Democrats who typically don’t post political content online, according to data from the Hidden Tribes Project." Why it matters: The more moderate group "has the numbers to decide the Democratic presidential nomination in favor of a relatively moderate establishment favorite, as it has often done in the past." The Trump administration has nixed Major League Baseball's historic agreement with the Cuban Baseball Federation (CBF), which would have made it easier for Cuban players to enter the U.S. legally without needing to defect. Why it matters: The goal of this deal was to help end the dangerous trafficking of Cuban players that has gone on for decades, resulting in players being threatened, extorted or even kidnapped. The agreement was similar to the ones MLB has with Japan, Korea and China and dates back to the Obama administration's détente with Cuba, which intended to soften relations between our two nations. But the White House argued Monday that the CBF is part of the Cuban government and that the agreement, therefore, violates U.S. trade law since MLB would be paying a fee in exchange for each player. What's new: Content creators have been caught between the media industry and technology-driven business disruptions. Now, the talent is trying to fight back, Sara Fischer writes in Axios Media Trends (subscribe here). Dozens of media companies have unionized over the past two years. Right now, Hollywood writers are waging war with talent agents who, writers claim, are taking an unfair cut of their profits. Why it matters: The media industry is facing unprecedented disruption, which is forcing the employment dynamics to change from decades-old precedents. "Stanford University has kicked out a student whose application allegedly contained false information," the L.A. Times reports. Stanford said "the student’s admission had been rescinded after officials confirmed that some of the material in the student’s application was not true." "The university also revoked credits the student earned while enrolled." Why it matters: "It never pays to lie on an admissions application because those misrepresentations, [even] if not caught immediately, could catch up with a student in the future." U.Va. has written "one of the most memorable and uplifting redemption stories American sports has ever seen," CBS Sports' Matt Orlander writes. 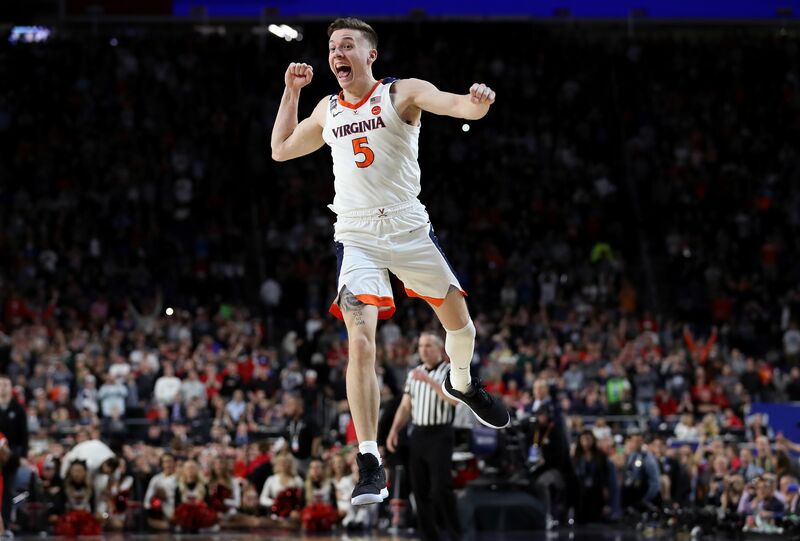 "Virginia's 85-77 overtime triumph against Texas Tech [last night] and its No. 1-rated defense came in an undeniably epic, and historic, 2019 national title game, just the eighth ever to require OT." "Virginia's first championship in school history and [Tony] Bennett's first title as a coach completes the circle." "[T]he curvature ... started on March 16, 2018, when No. 1 overall seed UVA lost by 20 points to No. 16 UMBC and became the most infamous loser in NCAA Tournament history." 🏆 Congrats to Craig Oppenheim of Westfield, Ind., who won the Axios Sports March Madness bracket. Craig has been an Axios reader for nearly two years and is a huge U.Va. fan. Sign up here for Axios Sports, Kendall Baker's daily dose of stats, videos and storylines.